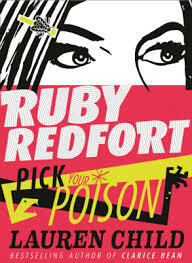 Meet Ruby Redfort: every smart kid’s smart kid. My favourite kid detective is back in a new adventure (jeez, this is sounding like one of those cringey TV adverts). When Baby Face Marshall escapes from prison, the press say that if anyone sees him, tell the police, but everyone assumes that he is already long gone. But someone with an innocent face, almost looks like a baby, gives the winner of The Twinford Environmental Explorer Awards, Amarjargel Oidov a bunch of flowers (the most poisonous in the world!). I physically love this book, I read it over the Easter holidays, and loved it! The plot is amazing, and the cliffhanger at the end 😞! !